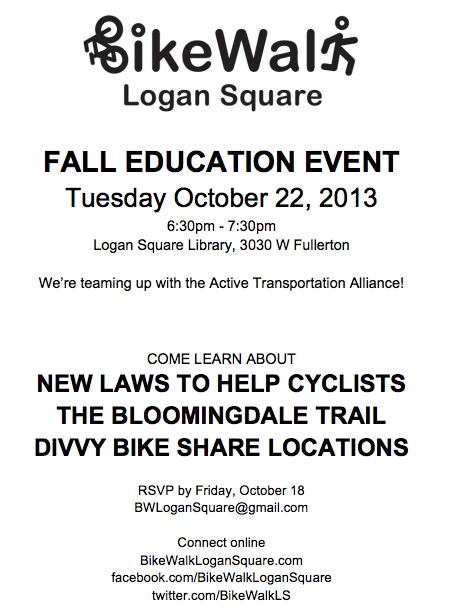 Bike Walk Logan Square is teaming up with Active Transport Alliance to host an educational event next Tuesday, October 22, at the Logan Square library. Come learn about new laws that help cyclists, progress on The 606 (which includes the Bloomingdale Trail), and the introduction of Divvy bikes to the neighborhood! 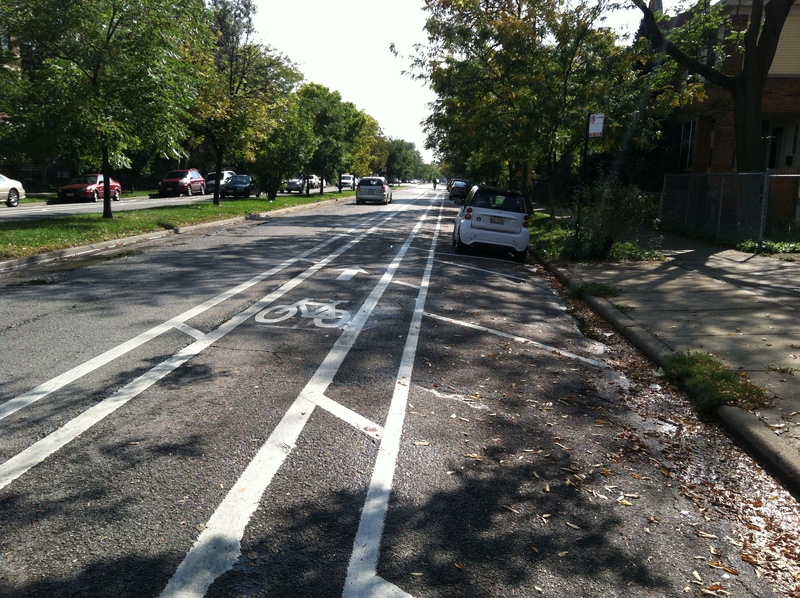 This summer, buffered bike lanes were installed on Kedzie Ave, between North Ave (1600N) and Palmer Square (2200N). 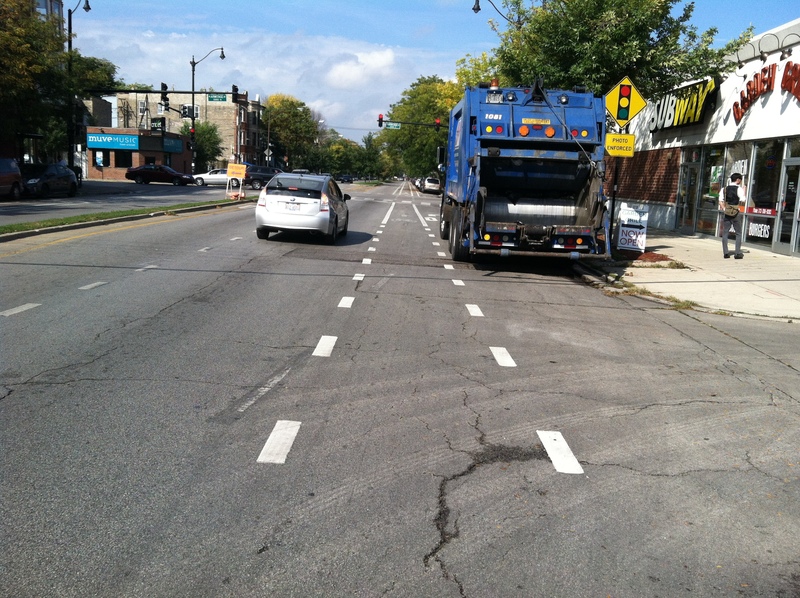 These are the first buffered bike lanes to extend into Logan Square. We are excited to see a piece of the city’s growing bicycle network in our own back yard. I recently took a ride down and back up the three-quarter mile stretch, snapping pictures and taking notes along the way. 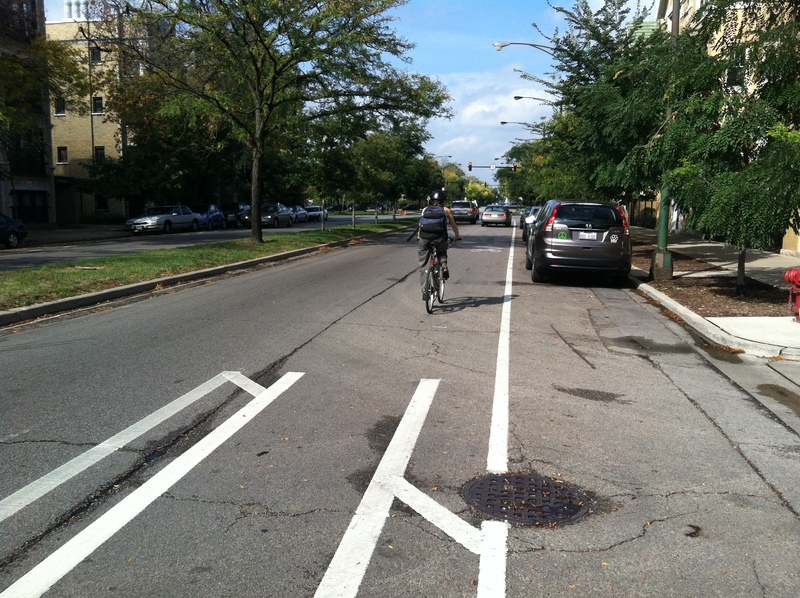 Heading south on Kedzie, the bike lane begins beyond the intersection with Palmer Court. 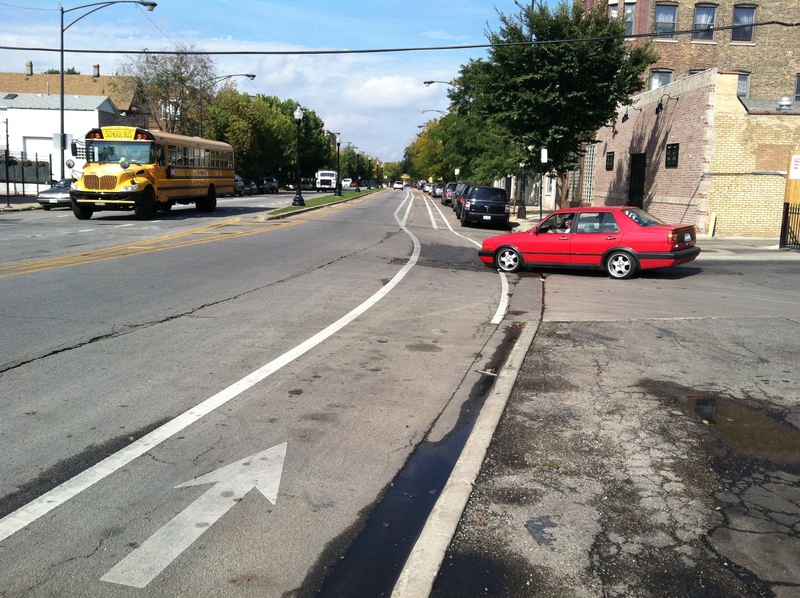 Anyone with experience biking in Chicago has dealt with this street design many times. The bike lane does not begin until mid-block, and it can be dangerous getting there. However, once you have reached it, the painted buffer on either side of this new bike lane provides a degree of protection from moving traffic on one side and car doors on the other. It is certainly an improvement over more traditional bike lanes. 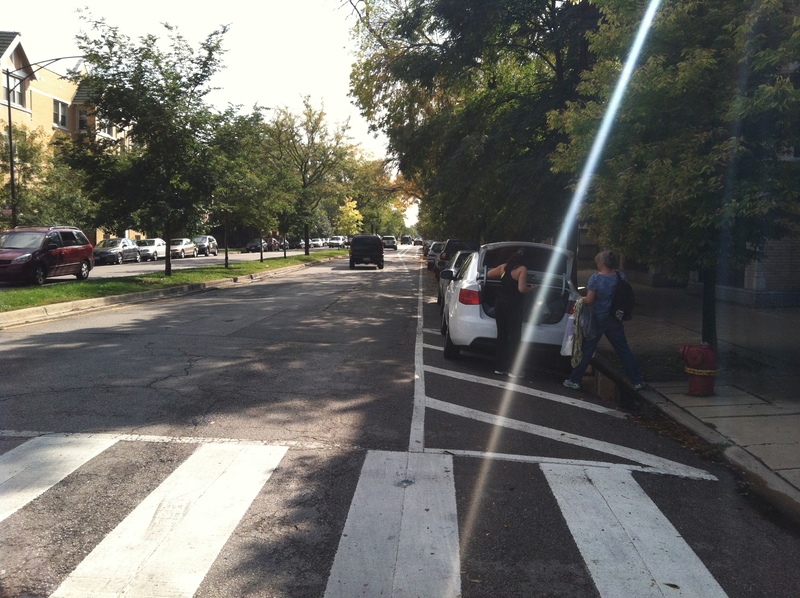 Shortly before reaching Armitage Ave, the buffer disappears, presumably to make room for a right turn lane. This intersection has been the sight of multiple fatal bicycle accidents (ghost bikes memorialize Amanda Annis and Blanca Ocasio). Hopefully, these new bike lanes will decrease the probability of such serious accidents occurring again. In addition to providing dedicated space for cyclists, bike lanes can have a calming effect on vehicular traffic, which could mean a safer intersection for cyclists headed in all four directions, and for pedestrians. A couple of blocks south of Armitage, the road narrows as it goes under what will soon be the Bloomingdale Trail (aka The 606). The buffered zone separating bicycles from moving vehicles disappears, and then begins again after the underpass. Parking is prohibited on either side of the underpass, mitigating the danger of opened car doors. North Ave is the southern end of the new buffered bike lanes. Unfortunately, the intersection at North Ave is wide open and treacherous. Traffic moves quickly in all directions, and there is no dedicated space for cyclists traveling through. The northwest corner of Humboldt Park is just behind the Illinois National Guard building (across the intersection on the left in the picture below), but there does not seem to be a very safe way to get there. 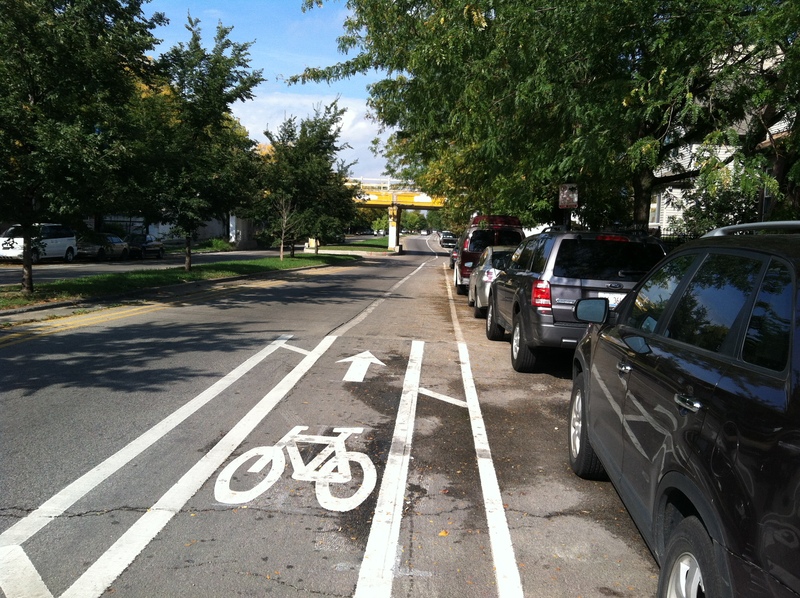 Still, it is great to have a bike lane that almost connects to beautiful Humboldt Park. Turning around and beginning the northbound trip, the bike lane starts immediately at North Ave and the buffers begin shortly thereafter. Unlike at Palmer, where I began my tour, I felt like I had space to call my own right away. Only the traffic turning out of the gas station (off camera to the right in the picture above) felt like a threat. 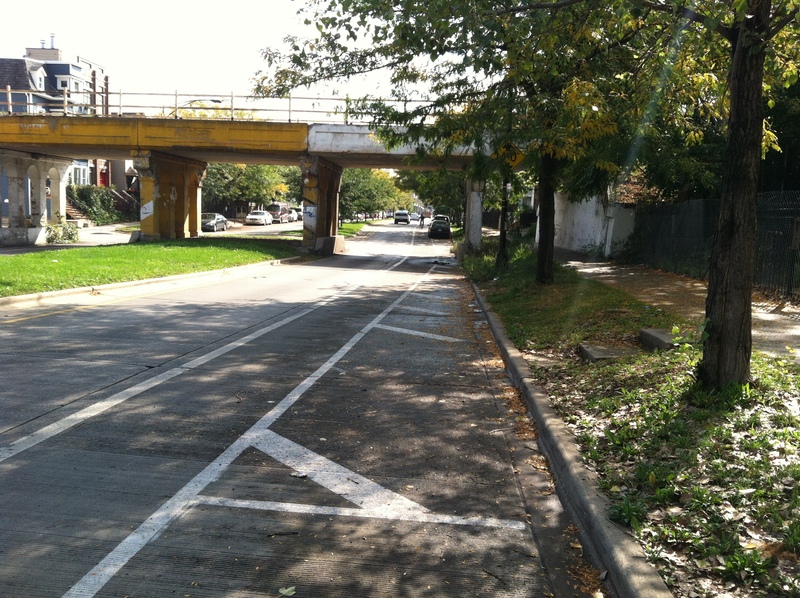 Once again, as I approached the Bloomingdale Trail underpass, the buffered lane disappeared. In this northbound lane, however, the buffer disappears a fair distance before parking parking is prohibited, leaving cyclists with another too familiar conundrum: whether to ride closer to moving traffic or closer to the door zone. 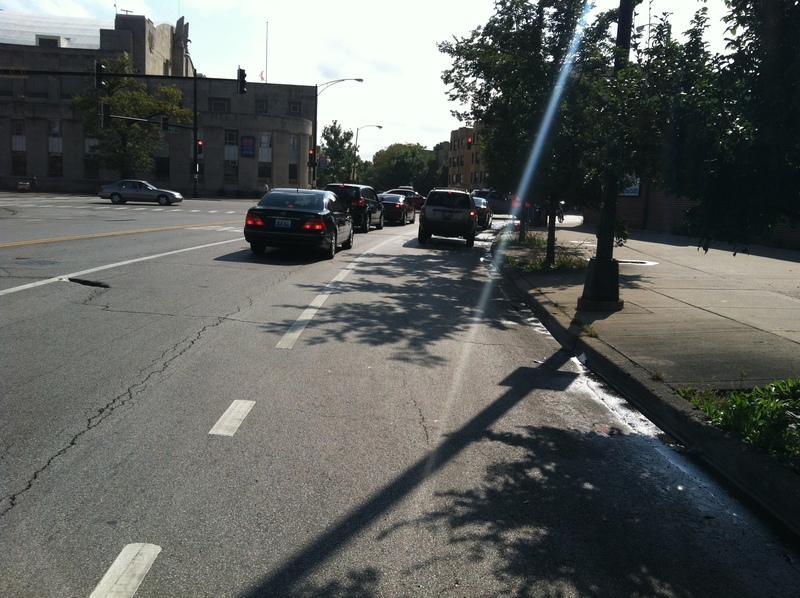 The northbound bike lane at Armitage Ave is similar to the southbound lane. The buffered zones disappear before the intersection and the bike lane runs between lanes for right turning vehicles and vehicles continuing north. North of Armitage, I encountered some very rough pavement in the bike lane. I was tossed around enough that I chose to move left and right, out of the bike lane to avoid the worst spots. The bike lane ends suddenly, before it reaches Palmer Square. Beyond the first light at Palmer Ct (ahead in the distance in the picture above), Kedzie becomes a four-lane road. 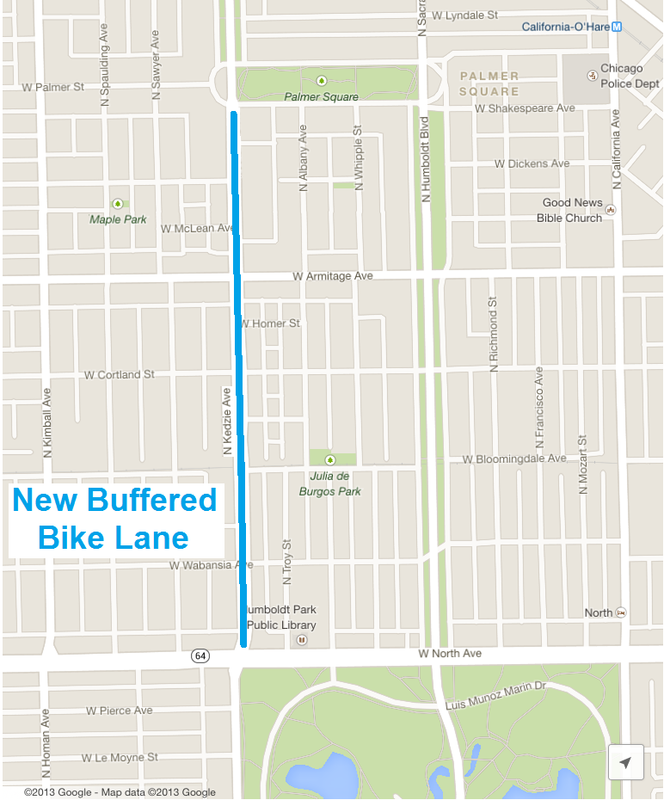 Then after the second light, north of Palmer Square, Kedzie turns into a boulevard, where the outer boulevard lanes offer a fairly safe option for cyclists. It would have been nice to have the new buffered lane fully connect to that outer boulevard. 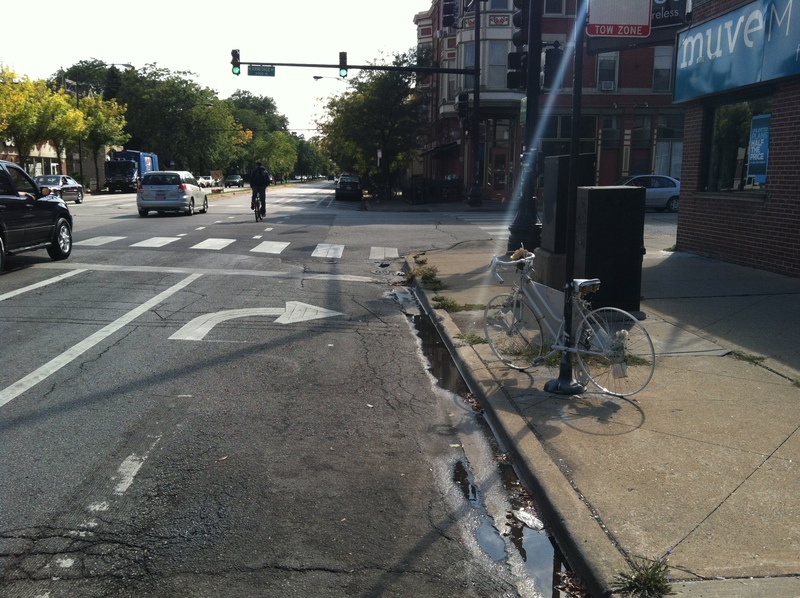 Hopefully, additional bicycle infrastructure will extend further north into Logan Square soon. Chicago’s Streets for Cycling 2020 plan has Kedzie slated to become a crosstown bike route, extending north to Logan Blvd. Looking North Approaching Palmer Ct. 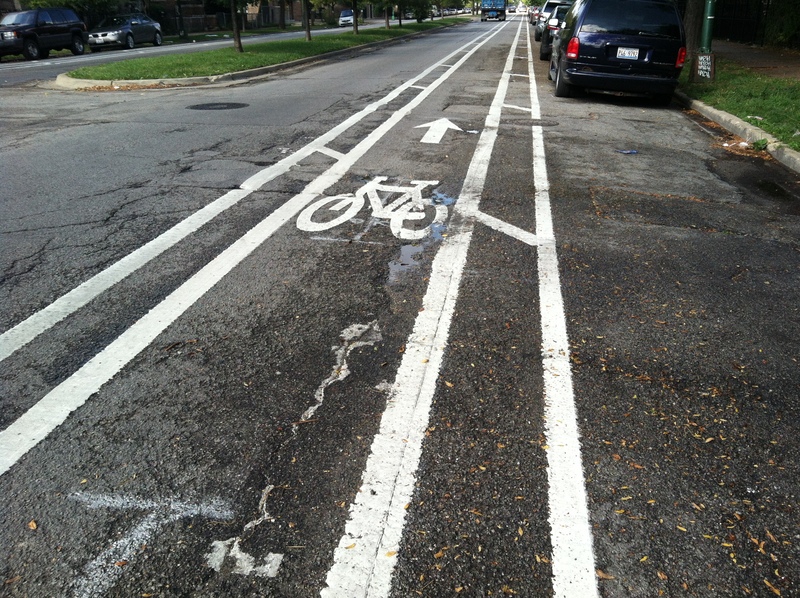 Despite its flaws, the new bike lanes on Kedzie are cause for celebration. Logan Square now has its first taste of the city’s recent push for improved bicycle infrastructure. We at Bike Walk Logan Square are delighted.